Before Museo Evita was opened in 2002 in Buenos Aires by Eva (or Evita’s, as she was affectionately called) Peron’s grandniece, the mansion had been a shelter for homeless women and children, Hogar de Tránsito. As Eva spent many of her last years on projects dedicated to helping the less fortunate citizens of Argentina, it only seems fitting that this is where the museum dedicated to her is now housed. Through photographs, original artifacts, videos, and quotes, the museum depicts Evita’s short life, beginning with her early poverty filled childhood in a Buenos Aires province. Once a teenager, Evita traveled to Buenos Aires to not only escape poverty but to also pursue an acting career. From here she gained great success as a radio actress and even had a short film career. Walking through room after room we learn of Evita’s relationship with Juan Peron and her move into politics as the First Lady of Argentina. From a poor childhood with no formal education, and coming right out of an acting career, she had her fair share of critics but quickly became a popular figure in Argentina. With her own money, Eva started the Eva Peron Foundation in 1948. Through a video, we learn of the many beneficial programs Evita initiated for Argentine citizens in need. She also had a great impact on women in politics, with a strong role in gaining Argentine women the right to vote. In 1951, Evita was diagnosed with cancer and died a year later at the young age of 33. A video goes into detail of the people’s mourning, her memorial, missing corpse, and final resting place in Recoleta Cemetary in Buenos Aires. 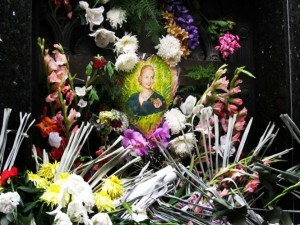 Her grave is always covered in flowers, showing that even to this day Evita remains a powerful icon and influence for the Argentine people. Museo Evita is located at Lafinur 2988 in Palermo. Admission is AR$12, and it’s open Tuesday – Sunday from 11am – 7pm. The museum also holds a gift shop, library, and restaurant, all with different hours. Definitely worth a visit! 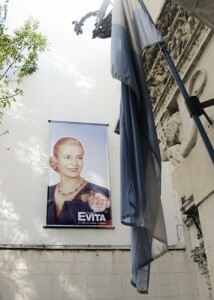 With DAR discount Argentinca card you get a FREE PASS to the Evita’s Museum! This page rendered in 0.584 seconds.